Father David Abdelsayed was born in California in 1974. He earned a Bachelor of Science degree in Engineering from UCLA and a Masters in Structural Engineering from the same university in 1999. He most recently completed a Masters in Marriage and Family Therapy from Hope International University in 2005. For many years, he served at Saint Athanasius church in Northridge as a Sunday School teacher and Youth Leader. 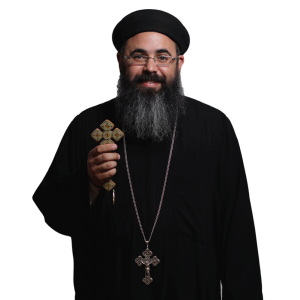 In 1998, he was ordained as a consecrated deacon for the diocese to serve at Saint Verena and the Three Holy Youth in Orange until his ordination as presbyter on February 19, 2006 to serve at Saint Maurice Coptic Orthodox Church in Pomona. In August 2015, His Grace Bishop Serapion assigned him to serve permanently at Holy Transfiguration American Coptic Orthodox Church.